A tinned set of 36 high-quality mushroom collecting cards, each featuring a common British mushroom with a high-quality photograph on one side and detailed notes on habitat, identification and culinary notes on the reverse. These tough semi-laminated cards come in a stylish tin with a see-through lid. 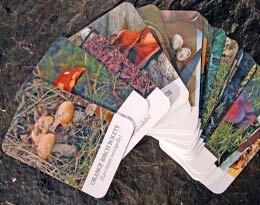 You can purchase these cards on-line by clicking on the logo below. This will connect you to the secure Nochex money transfer system. If you are responding to a magazine special offer, enter the name of the magazine in the message box and the appropriate payment. The cards will be sent by first class post.